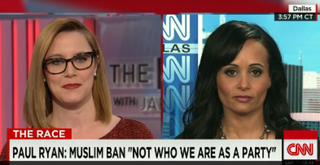 Donald Trump's national spokesperson, Katrina Pierson, got into a heated debate with CNN's S.E. Cupp on Tuesday as she defended the 2016 presidential candidate's outrageous proposal to ban all Muslim immigration to the United States. In the debate, Pierson seemingly saw no difference between law-abiding Muslims and religious extremists, and contended that the United States has never before allowed "insurgents" to come into the country. "Yes, from Arab nations," Pierson responded. "You know what? So what? They're Muslim." "So what?" the CNN political commentator said in apparent disbelief. "That's not the America we live in." Still, Pierson didn't seem to see the difference and defended her boss's position. "You have people coming across through the refugee system and the visa system—including the woman that came in San Bernardino on a visa system, as well as some of the 9/11 hijackers. We have to put a pause to figure out how we could better vet these people," Pierson said. Cupp made it very clear from the beginning of the segment that she wasn't impressed with Trump's comments, much like most lawmakers and citizens across party lines, and called the proposal "pretty dumb." Pierson, for her part, dismissed criticism of Trump's proposal, including denouncements that came from House Speaker Paul Ryan and other Republican leaders. "Speaker Ryan and the rest of the establishment haven't really been pushing Republican values to begin with," Pierson said.